Beginning February 1, anyone who adopts a dog from the Licking County Dog Shelter (LCDS) will received a $25 Petland gift card and free 4 lb. bag of dog food. Heath General Manager Hope Mills at Petland Heath’s January adoption day with the Licking County Dog Shelter. “The Licking County Dog Shelter and Adoption Center appreciates Petland’s donation of gift cards and dog food for our dog adopters at the Heath store. 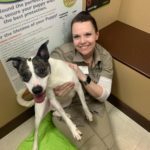 Their support through general manager Hope Mills, of monthly adoption events for our shelter dogs at the store has resulted in adoptions and exposure for the shelter, ” said Licking County’s Chief Dog Warden David Shellhouse. Stay up to date with Petland Heath’s adoption days with the LCDS on Facebook and view the dogs available for adoption at LCDS here. The gift card program has been incorporated into Petland Charities, a 501c3, whose mission is to help support shelters and service animals. The program was piloted at the Ross County Humane Society in Chillicothe, Ohio.